Activities | Patrick Schmidt, Ph.D. The journal Theory into Practice is a highly recognized, highly rated journal with a long and influential history in the field of education. Co-Edited by Cathy Benedict and Patrick Schmidt, this volume brings together a cadre of scholars who discuss the challenges of an education in and through music in contemporary society. Other contributors are Lee Higgins, Pam Burnard, Elizabeth Gould, Don Lebler, Randall Alsup, Deborah Bradley, Ruth Wright, Hildegard Froehlich. The National Society for the Study of Education (NSSE) has released its 2012 yearbook entitled: The Place of Music in the 21st Century: A Global View. butions by authors such as James Mursell, Lilla Belle Pitts, Charles Leonhard, and Bennett Reimer, among many others. The 2012 NSSE Yearbook has contributions by Richard Colwell, David Myers, Paul Woodford, Patrick Jones, Carlos Xavier Rodrigues, Graça Motta, Matt Thibeault, Cecilia Ferm-Thorgersen , Eva Gerogii-Hemming, and Lauri Vakeva. The book was edited by Patrick Schmidt and Cathy Benedict. 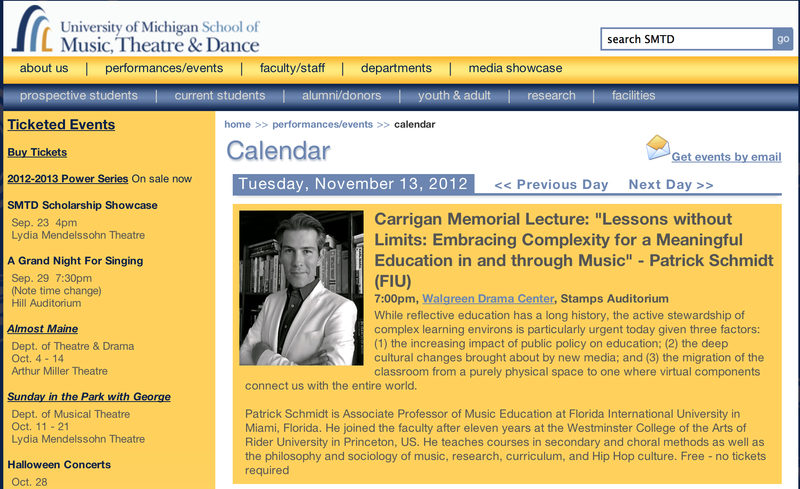 In February of 2012 I delivered a two week intensive seminar on music education and arts policy at the Sibelius Academy in Helsinki, Finland. This was an innovative structure and format presenting an issue that is of great importance but rarely discussed in great focus in Music Education. Click below to see a local magazine with an article on the seminar. 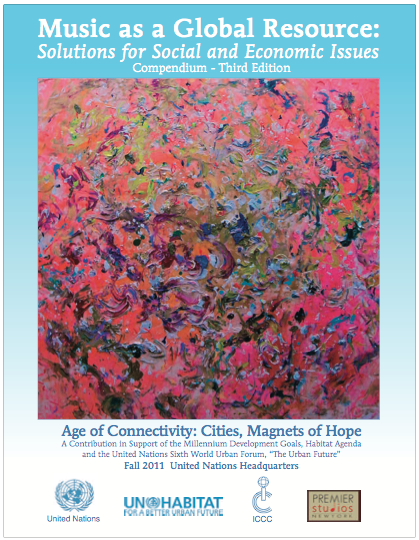 The MAGR compendium is sponsored by the United Nations. As one of the editors of the compendium Schmidt aided in the investigation, selection, and organization of over 70 programs, spanning over 40 countries. The Music as a Global Resource Compendium offers a innovative way of looking at how NGOs, community centers, organization and schools provide a multiplicity of ways to educate in and though music. This is a seminar focused on providing teachers and supervisors within the arts with a clear understanding and ways to act toward the most significant issue of policy and teacher evaluation. 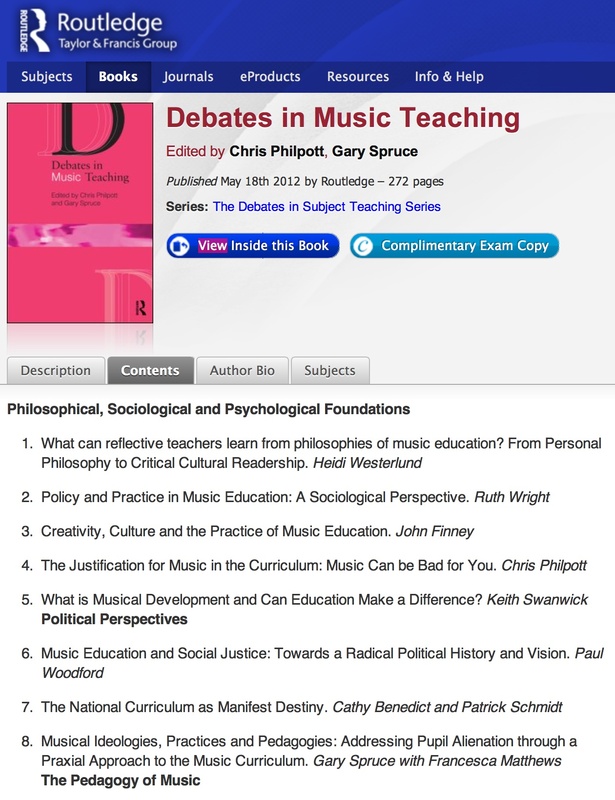 This new title by Routledge brings together a very interesting collection of chapters and provides a critical outlook of music education practices and theories focusing on political, pedagogical, philosophic, and sociological issues as well as issues of professional development within the music education profession. Click on the picture for more information and purchase. Click here for the link to the program and information about the lecture delivers in Örebro, Sweden. Society for Ethnomusicology – Education Forum, Mexico City, Mexico, November 2009. CMS Conference, October 2009 Panel with Hal Abeles, Jeanne Goffi-Fynn, & Patrick Jones. The focus of the panel is on two issues critical to the effectiveness of online instruction in music, but generally not focused on by our more technically-oriented colleagues. While technology is important in supporting online instruction, how the instruction is organized both within and across online courses is critical to the effectiveness of instruction. Our focus on pedagogical principles will examine strategies for and the potential of online student-centered instruction. Panelists, each experienced with online instruction, will share their experiences with strategies such has collaborative projects, peer review and assessments, student led chats and discussions, student development of project scoring rubrics and student selection of course project topics. The panelists’ focus on online curriculum implications will examine how online course can be coalesced into degree programs. Reflective teaching has a long history of scholarly investigation. It has been reviewed in sociological terms (Lortie, 1975), made the focus of higher education (Carnegie Forum, 1986), problematized in terms of student teaching and its structure (Berliner, 1985; Evertson et. al., 1985), and analyzed as better practices (Valli, 1992). Further, comprehensive outlooks at teacher education (Cochran-smith, 2005; Darling-Hammond, 2005) continue to press for the need of reflective teaching. Less considered are the ways that reflective practice can be adapted to, and enhanced by, cultural changes resulting from new technologies and media. Active stewardship of these adjustments are particularly called for given the increasing use of digital technologies, deep cultural changes brought about by new media, and the migration of the classroom from a purely physical space to one with significant virtual components that often connect with the entire world. As technologies afford new modes of interactions and patterns of accessibility continue to constantly morph, new opportunities arise for re-envisioning the nature of learning and teaching. This panel will present conceptual and practical ideas that share our attempts to meaningfully connect practice with students’ thinking and acting in what Henry Jenkins (2006) calls “convergence culture”, where participatory interactive democratic structures level everything from fan culture to political campaigns. The fields of policy and leadership have dealt with significant change and have recently been presented with many challenges. The connection between change and challenges is an essential characteristic of leadership development, that is, strategic thinking, which in turn is critical when gaining a clear understanding of policy (Weaver-Hightower, 2008). A pressing reality in education today is the interaction between the imperatives of policy and the demands they pose upon leadership (Ball, 2003; Cohen 2007). At a time where economic constraints assaults higher education institutions and cultural change assails societal norms – and consequently, artistic production – it is clear that policy and leadership considerations matter greatly (Colwell 2005, 2006). future leaders and otherwise cultivate and support leadership within the profession? What are the current practices and experiences upon which scholarship/research is, or can, be based? What models (conceptual or applied) are in place today for a systematic development of scholarship that addresses policy and leadership in tandem? further thought and action in tertiary education in general and at SMTE in particular. Presentation at Sibelius Academy, Helsinki, Finland, April 2009. 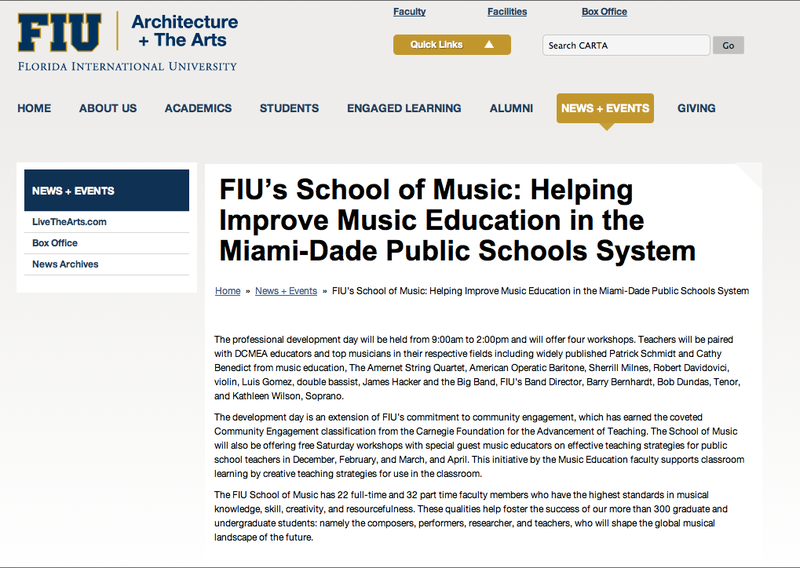 The role and interaction of Non-Governmental Organizations in Music and Education. This study considers the manner though which various and often paradoxical discourses in teacher preparation programs have an impact in the formation of young teachers’ conceptual understandings of themselves and their practices. Focusing upon the perceptions of teachers in five urban classrooms in New York City, this study looks at the manner in which higher education discourses have an impact in the practice of first and second year teachers. Four conceptual notions of discourse emerged from the study, and structure the interpretative spaces between discourse and pedagogical enactment. 1) Discourse of Enactments: validates discourses as rhetorical and often disconnected, leading to pedagogies of reproduction and repetition; 2) Enactment in Discourse: engages in the constant reflexivity of pedagogical moments; 3) Discourses of the ‘Real’: where experience is connected to past legitimized and normative parameters; 4) Discourse of Conflation: attempts to legitimize pedagogical discourses through manipulation of discourse and absence of conflict. The variance with which the teachers in the study conceived and used the above-mentioned discourses, suggests the preeminence of a ‘performativity’ (as in the work of Judith Butler) in their identity formation. In fact, the experiences of these young teachers, particularly in their multiplicity and disconnect, may lead us to consider that the sedimentary nature of identity formation is no longer an appropriate norm to understanding the development and life of music educators. One of the implications of such proposition would be to consider how teacher preparation would change if instead of identity formation, music educators would be asked to consider either subjectivity, identity ‘management’ or ‘maneuvering’. The analysis presented by the study made conflates critical-marxist and feminist frameworks, developed primarily through the lenses of Apple (1988), Althusser (1988) and Butler (1997). Making Our Lives Simple: Are Standards and Lack of Critical Leadership Related? The end is where we start from (Eliot, 1952, p. 144). Based upon traditional notions of policy action and thought ‘the’ National Standards for the Arts in the United States were developed as an end that would be rhetorically articulated as a beginning; that is, the presentation of a long history of defined educational behaviors as a document that would be foundational for practice in the field. However, while the absence of any systematic re-thinking of the standards in music education speaks both to their omnipresence and its role as an end document, it also speaks to its irrelevancy. Our field has, almost silently, almost in consensus, taken it to be a proper, indefatigable, and perhaps, inconsequential end. In this paper, following the lead of Maxine Greene, I propose an exercise in ‘thinking of things as if they could be otherwise’. 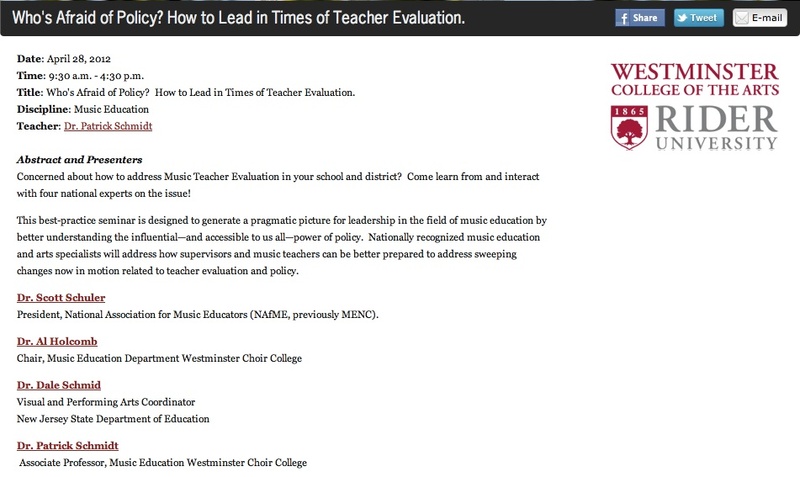 Here, I suggest that we consider that this lack of exploration, the absence of any ‘troubling’ of the standards – or the performativity norms attached to traditional notions of ‘having standards of practice’ – comes from the absence of complexity in how the music education profession systematically understands and envisions leadership. Considering that standards discourses are the last powerful stand of the modernist project, I argue that ‘leadership’ has been mischaracterized in and by standards’ notions, and must be re-articulated based upon a critical constitution of educational rigor, reflexivity and multi-subjectivity. This model departs from Dewey’s ‘horizontal leadership’ moving past it, toward a Betsonian ‘double description’ where stronger interactions between part and whole are articulated. Assuming that standards discourses have lead to the negation of what Maxine Greene has called ‘wide-awakeness’ or what Paul Willis calls ‘symbolic creativity’, I propose the following question: Is it possible to match the postmodern reality of multiple sources, informational complexity and speed realities to models that transform ‘standards’ in complex, grounded and responsible enterprise? 9th Annual Curriculum and Pedagogy Conference, Decatur, Georgia, October 2008.